Organize and log your tax-deductible receipts. Organize dresser and kitchen drawers — one at a time. Write a letter to somebody you haven’t been in touch with for way too long. Mend holes in your clothing. Make use of your mismatched socks. Make — and enjoy — your own hot pack. Organize CD and DVD collections. (Do your DVDs and CDs end up in the wrong cases? Now is your chance to fix it). Give yourself a manicure and/or pedicure. Plant a window-box herb garden. Forward this post to somebody who watches too much TV. Ponder 100 ways to change your life. Make this year’s Christmas presents. See if you can actually prepare a meal just as quickly as they’re cooking it on the cooking show you’re watching. Clean your plant’s leaves (using powdered milk, banana peels, or mouthwash). Give (or get) a massage. Scrub coffee stains off your mugs with baking soda. Prepare lunch for the next work day. Accumulate frequent flyer miles for your next vacation. Have a laptop handy to research quirky concepts that you see on TV. Here are some more bite-sized tasks you can take on during the commercial breaks. In some cases, using the commercials to time these activities (like sit-ups) can make them more palatable and reduce the discipline required. Clean the house — two minutes at a time. (See if you can get a whole room done by the end of your show). Alternate doing sit-ups and push-ups constantly through each commercial break. Throw a ball for the dog. Think about how the TV show could have been written better. Contemplate how to get back that time later. According to my wife, mostly snore. 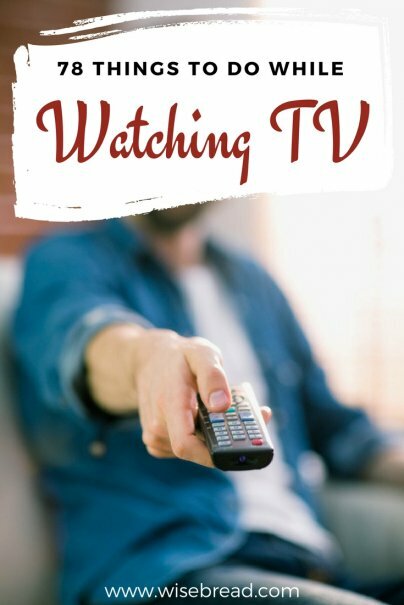 What do you do while watching TV? laundry. start & empty loads during commercials. this assumes that you are mindlessly watching tv. if you are purposefully watching tv, many of these won't work. although some will, such as exercising or cleaning. some I'd NEVER do,such as paying bills. Hard to do Nora with my thumb always MUTE. Seriously a good list and a great idea. This could be read as a list of things to do INSTEAD of TV. i do crunches and yoga. Some of these suggestions make ZERO sense. How can you meditate or journal while watching television? Both activities require complete peace and quiet, so you can reflect and connect with your inner thoughts. I've tried doing them while watching television and it doesn't work. If you're doing either activity in front of your television, you're surely not paying it any attention. I also don't see how you can devote the proper attention to writing a detailed letter while actively watching television. And if you're reading a book, or making out, your eyes certainly aren't on the TV screen. Most of these things I can do while listening to my television in the background but NOT while watching it. I love to knit when I watch tv. In fact, I do it while traveling, while having casual conversations, and even at my Weight Watchers meetings and counselling sessions. I have Asperger's Syndrome, and sometimes my fidgeting distracts me, or I feel uncomfortable with making eye contact. Since knitting is something that I can do with my hands almost automatically, I can focus better on conversations, and even increase my eye contact comfort. I'm a fidgeter too, and I used to knit during some of my college classes. I introduced myself to my professors on the first day and explained that I still took notes and paid attention, and that knitting helped me focus. None of them ever had a problem with it, and I knitted a full blanket one semester. What I do while watching TV (two hours per night, usually) depends on how productive I've been (or felt I've been) the rest of the day. If I've been super-productive, I let TV be my break and don't do anything but snuggle with my husband. If I haven't been productive, I usually end up doing something while watching TV. Things I often do while watching TV: run the laundry, fold the dried laundry; mend clothes; organize the living room. I've found that if I'm watching TV, that's my primary activity. The other thing I'm doing has to take up less of my mental capacity or it doesn't get done. If I actually want to be productive, I usually opt to listen to music/the radio. There's rarely anything in particular on tv that requires all my brain power. So like you - I often end up doing things that take up less mental capacity but need doing nonetheless. I've been crocheting hats for the Hat Box Foundation - so I'm keeping my hands busy, not eating between meals and getting a tax deduction while helping the homeless keep warm in the winters. I channel surf or mute the TV and turn on Pandora. I also switch on the commercialbreak.com app. The app notifies me on my iPhone when the show is back! !